Every week, Dr John condenses his blogs into a free weekly newsletter – keeping you up-to-date with the most pertinent health stories of the week. Never again will you run the risk of missing out on some information or advice that might have a critical bearing on your health and the health of your loved ones. 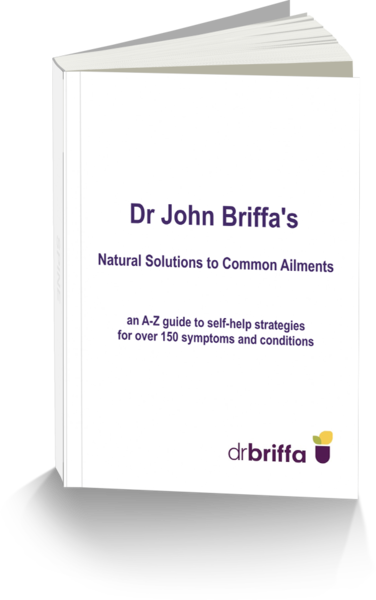 Sign up for Dr Briffa’s free weekly e-newsletter now and get this gift – ABSOLUTELY FREE. E-book: Natural Solutions to Common Ailments – an A-Z guide to over 150 symptoms and conditions.This e-book contains information and naturally-oriented advice on a wide variety of health issues including irritable bowel syndrome, fatigue, acne, eczema, arthritis, constipation, pre-menstrual syndrome and menopause, and is fully scientifically referenced. Running to more than 50,000 words, the A-Z guide offers some of the most useful health-related information available today. We promise NEVER to share, sell or loan your email address to anyone, for any reason whatsoever.